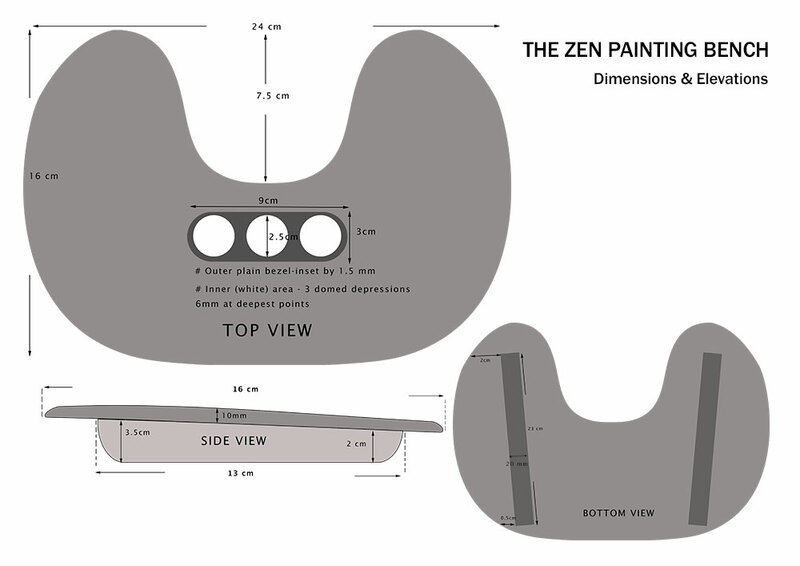 Based on the Zen principles of design, The Zen Painting Bench is an aid for figure painters, especially useful for working on fine detail. 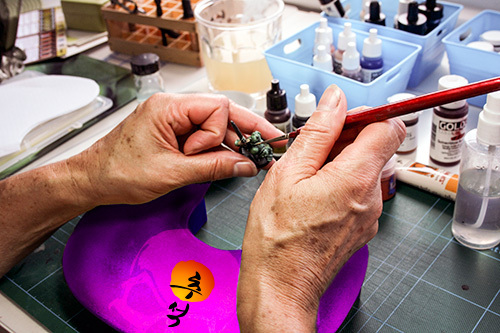 The idea is a simple one: it gives the painter somewhere convenient to rest and steady their hands while they’re painting. But it also seems to focus your energy more effectively – helping you to achieve that ‘zen’ state of concentration when you do your best work. At the moment, there are a couple of prototypes in development; made of basic recylced material. 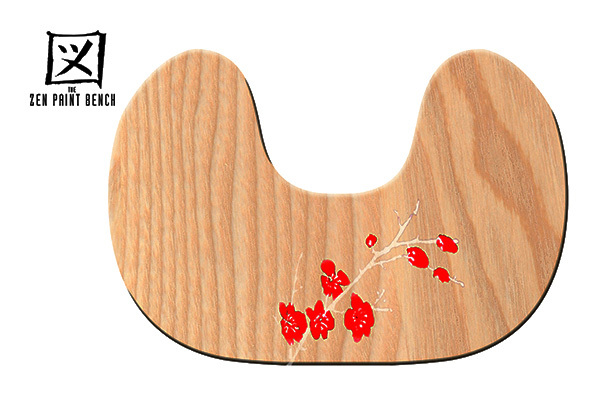 The first is made of polished and warnished wood and is the most true to the Zen principles of simplicity in design. 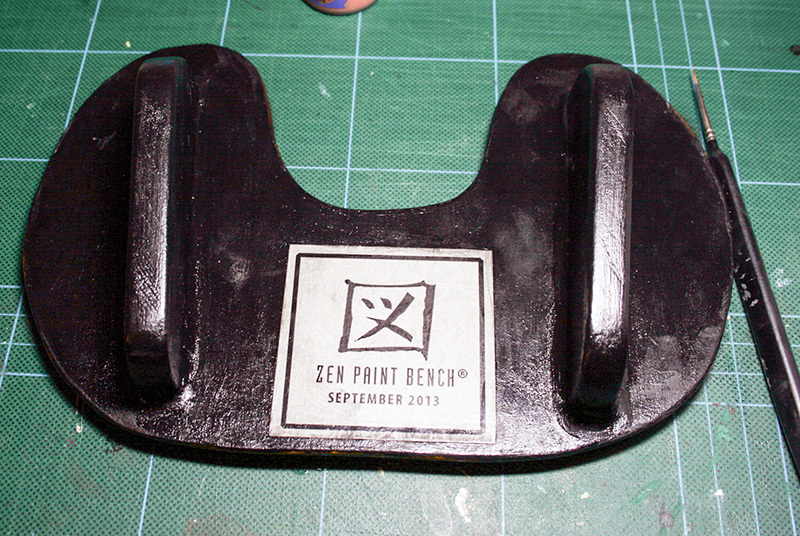 It is obviously of primary importance that the bench feels pleasant to rest your hands on. 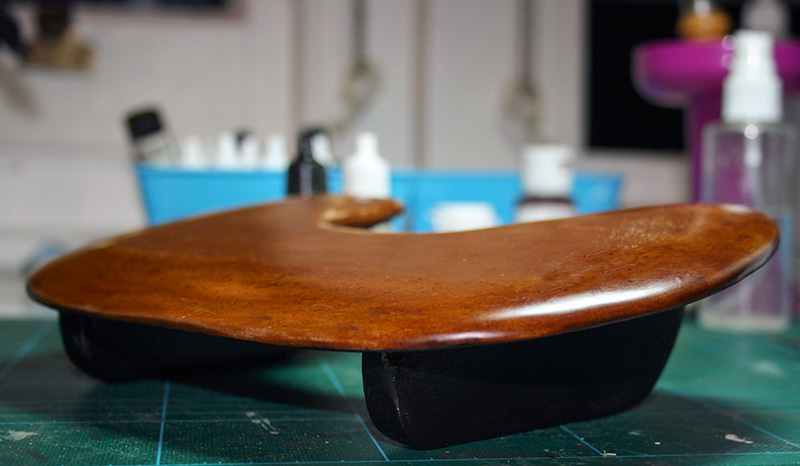 It must be smooth to the touch and should ideally be slightly convex shape and have no hard edges. 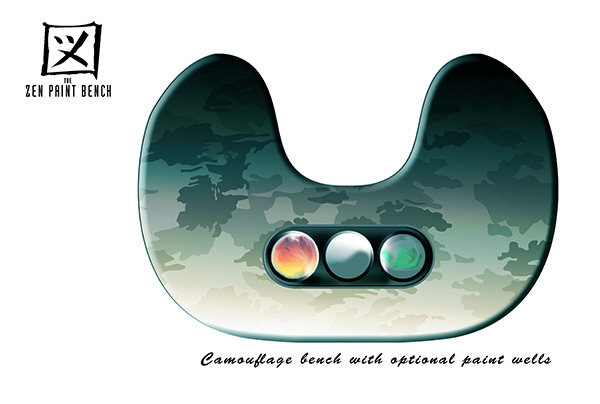 The cutaway section lets you ‘dangle’ your figure over the edge of the bench. 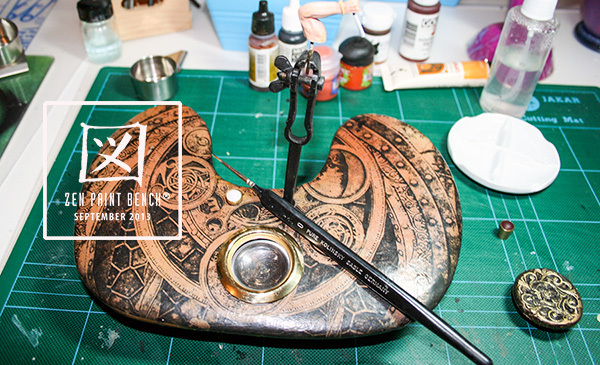 At this scale, the optimum use would probably be for models between 28mm and 90mm. 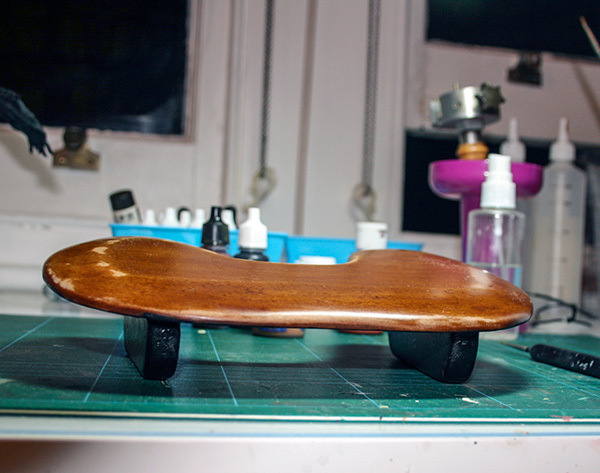 The appeal of the bench is very much about the way it looks and feels rather than its just its usefulness per se. Its obvious target market would be a ‘serious’ painter – or somebody who saw themselves as one – possibly a mature person with a bit of spare cash. 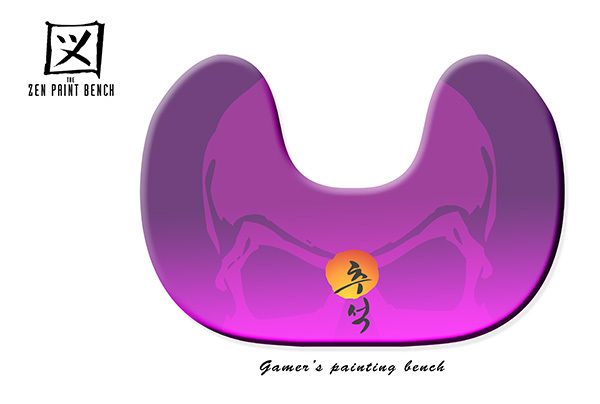 But another potential market could be younger people, possibly gaming enthusiasts, who bought it in a souped-up, skateboard version, (see below) for its decorativeness, or wanted to customise it themselves. Made of a light enough material in sufficient quantity to reduce the cost per unit, this could be the gaming equivalent of a frisbee with all the same kinds of promotional possibilities in terms of branding and add-ons. In other words you could position this either as an ‘exclusive’ type of product – hand-made, custom designed, each a one-off – and make them strictly to order. Or, depending on price per unit, try and sell them cheaply enough to reach a wider market. Of course there’s no way of knowing, at this stage, if it will catch on at all . . .
For a large run: a casting or injection moulding would be the quickest and easiest way to achieve this. 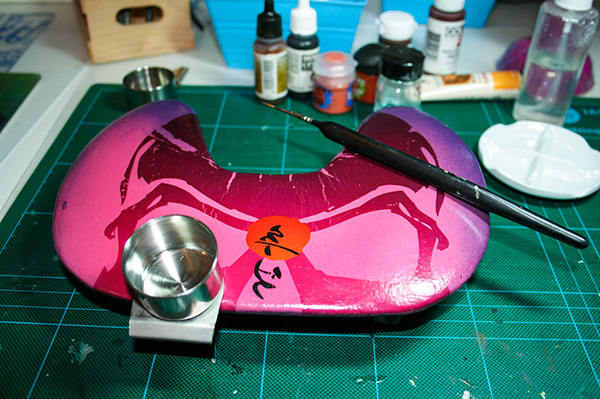 (In the ideal situation, moulded plastic would be the best material to use). For a short run: wood is a more practical and ‘greener’ substitute – if more labour intensive. 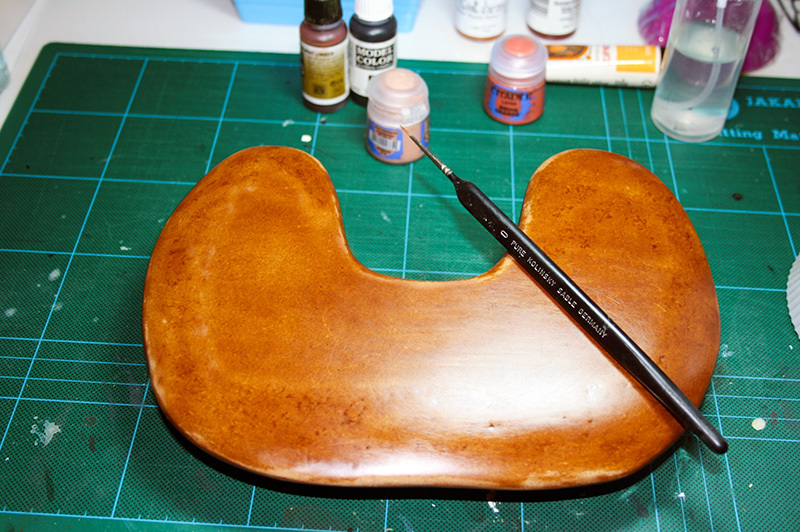 The first prototype was made from 9mm MDF, a very cheap material, with basic DIY tools. Better tools would produce a better finish. There is no reason why the bench shouldn’t be colourful and individual. Customisation is something to be encouraged. A couple of built-in paint wells mounted in the center of the bench for easy access. Pads added to the hand decks for comfort. Or maybe a removeable thin rubber mat.